Strain and Structure is a body of sculptural work that quietly demands a sense of inquiry and intimacy, aiming to evoke in the viewer the will to touch, get closer, go around and slow down. 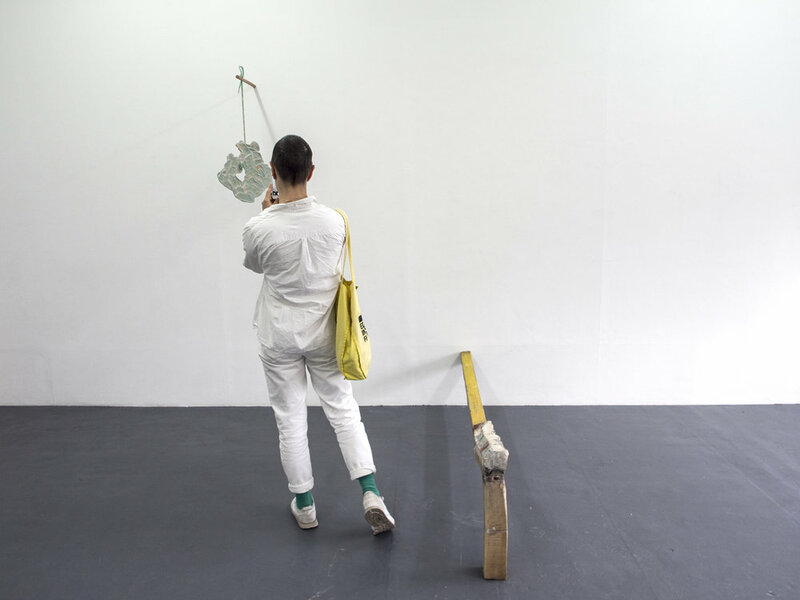 The work revels in a haptic process of making that is led by a preoccupation with materials, in particular the excess and the bi-products of construction: cut offs, supports or general debris/found objects. These forms and structures intertwine flaws and features, blur material histories and create new relationships. Crafted from the bi-products of industrial processes and re formed into beguiling new iterations that push at the boundaries of painting the work openly embraces the poetics of the provisional. Weight, tension, fragility, suspension and balance are all materially enacted and pushed to their limits in an installation that is paradoxically underpinned by a will to perfect, to render these waste materials new again by shifting our relationship to them. These forms and structures will teeter and push back at the viewer revealing details and surfaces only to those willing to spend time with the work. 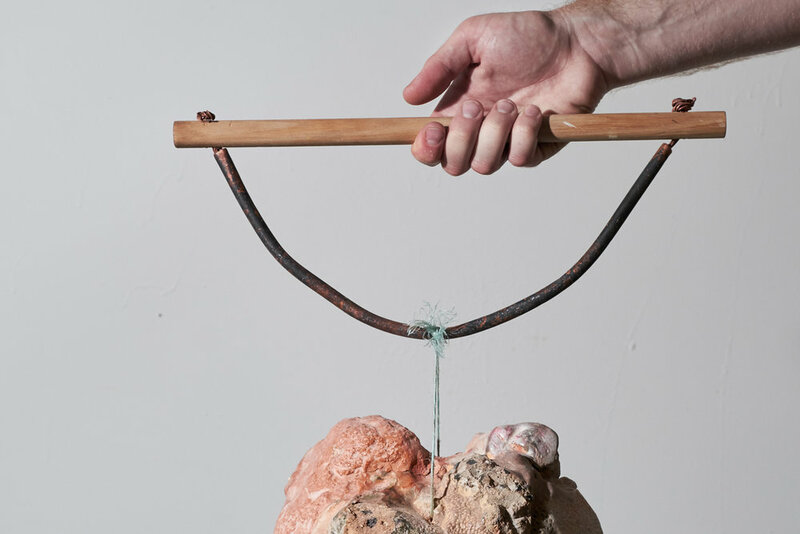 Images | Ro Noonan, Weigh better (detail), 2017, steel, plastic, plaster, metal, concrete, Sculpey, Apoxie Sculpt, pipe/s, Dimensions Variable, Image Credit: Tasha Tylee; Ro Noonan, Lift, but don’t, 2016, wood, copper, plaster, rocks, Apoxie Sculpt, putty, acrylic, twine, clay, Dimensions Variable, Image Credit: Tasha Tylee; Ro Noonan, Stick around (detail), 2017, salvaged glue, glue, wood, rope, Apoxie Sculpt, Dimensions Variable, Image Credit: Tasha Tylee; Ro Noonan, Weigh better (detail), 2017, steel, plastic, plaster, metal, concrete, Sculpey, Apoxie Sculpt, pipe/s, Dimensions Variable, Image Credit: Tasha Tylee. Unexpected collisions occur in the haptic amalgamations of Ro Noonan. Industrial off-cuts and byproducts fuse and twist; iron, steel, plaster, wood, concrete and hosepipe come together in the construction of strange new forms. Collected from building sites and city skips, the elements within each work are carefully chosen with bowerbird precision for their unique qualities. Each fragment is scrutinised and catalogued – for surface, shape, weight and colour - before being subjected to a series of transformative processes. Underpinning these actions, and central to Noonan’s practice, is the verb to fit. His jigsaw-puzzle logic seeks, through a series of trials, to bring together disparate elements, either physically – as is the case with the hosepipe that sheathes the steel rebar of Weigh Better – or aesthetically – as is the case with his near-obsessive collection of pastel-hued refuse. In bringing together these rejected elements, Noonan tests their ability to co-exist. Whilst each individual element maintains its own aesthetic intrigue, it is the point of connection rendered between each material that is the most beautiful aspect of Noonan’s work. 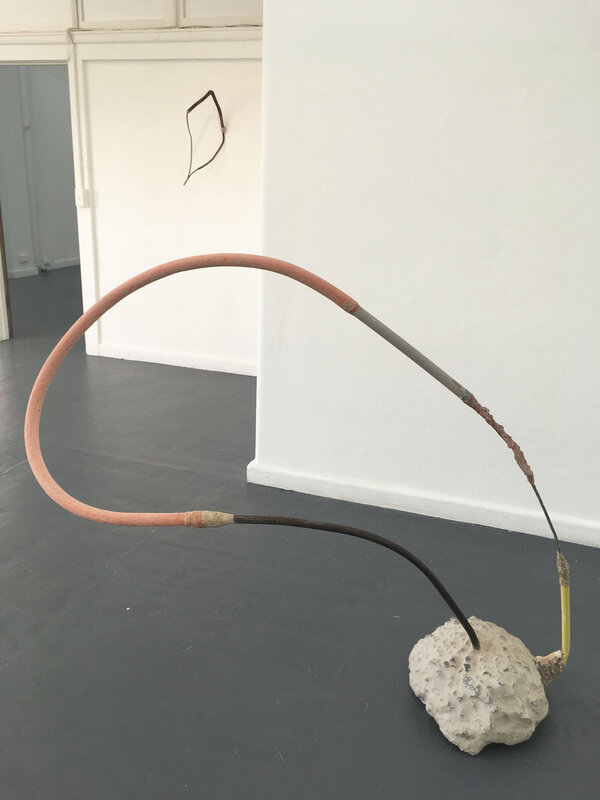 Tape, putty, paint, rope and glue are all gracefully deployed to erase the singularity of each material, confusing the beginning and ending of each and leaving us with new, often geological-seeming sculptural conglomerates. 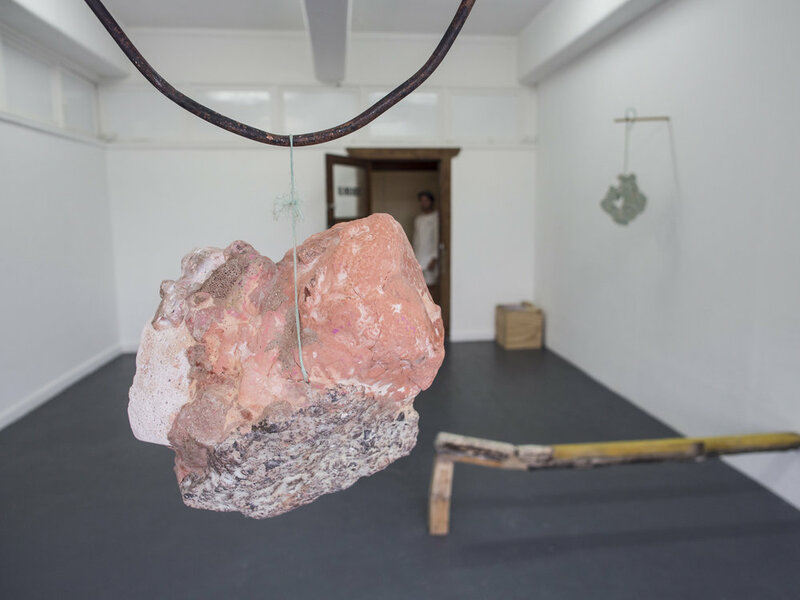 Whilst these outwardly haphazard structures appear quick and provisional they are actually gradual works, built up in sedimentary layers over long periods in the studio. In an ever-quickening world, where waste is discarded in increasing volumes, the slowness of these works, with their deliberate centering of gesture and connection, return significance to these discards and invite the viewer to reassesses our systems of value. By focusing on the minutiae, whether it be the embodied histories of each material, their juxtaposition or the delicately rendered surfaces, these works reward those willing to sit with them, to get close and look. So slow down for a moment and get lost in Noonan’s industrial-organic works, where castoffs collate and become monuments that articulate the slippage between the everyday and art. Exhibition text by artist + writer Jake Preval. Ro Noonan is a Melbourne-based artist that graduated from Victorian College of the Arts.